More fencing with personality--these posts have been braced to keep them from falling over. The extra loop of barbed wire was probably tossed over the post to keep a horse or cow from getting tangled in it. The show reception was well attended and several paintings sold, so I'm very pleased. Old friends I hadn't seen in years dropped by, and it was fun to re-connect. Glad the show went well Don. I like the simple, clear design in this painting. The sky especially contributes so much to that overall feeling of unity. I like "unambiguous" skies. Not sure that makes sense. Congratulations on your sales! Its a wonderful thing when buyers open their wallets and recognize the value of art. Your presentation looks professional and striking. I imagine the hung exhibition looked great! I like your fence stories... and the painting too. Makes sense to me, Sheila. 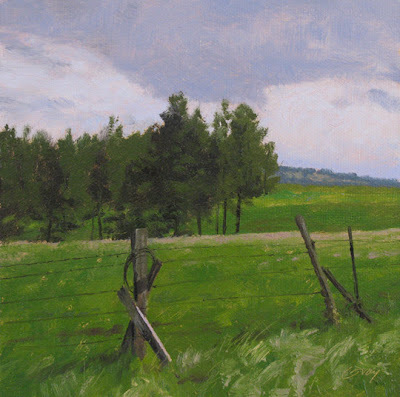 The Starkey country, where these fences are located, is made up of broad meadows and thick clumps of pine. It's ready-made for simplicity of design. Thanks for the note. Susan, thanks for your encouragement! Don, I always feel like I'm "right there" in these paintings. I appreciate hearing that, Micah--thank you. Love the landscape especially the colors in the sky. Don, glad to hear the wine and cheese, etc. were a hit, but I selfishly hope you didn't sell the crow. I loved it when you first posted it and still do, even with all the blood, sweat and tears all over that handsome frame. Please lemme know. That's kind of you, Jean--thanks. Thanks a lot, Sam. I'm delighted you like the crow. He's still fluttering around my studio--I'll hang on to him and email you after the 14th, okay? This looks like the perfect spot for a picnic! It is a great spot for a picnic, Dean. Sweeping views of rolling green hills everywhere you look. Thanks for the visit.